The QCD Expander is an expansion module for the Quad Clock Distributor (QCD). 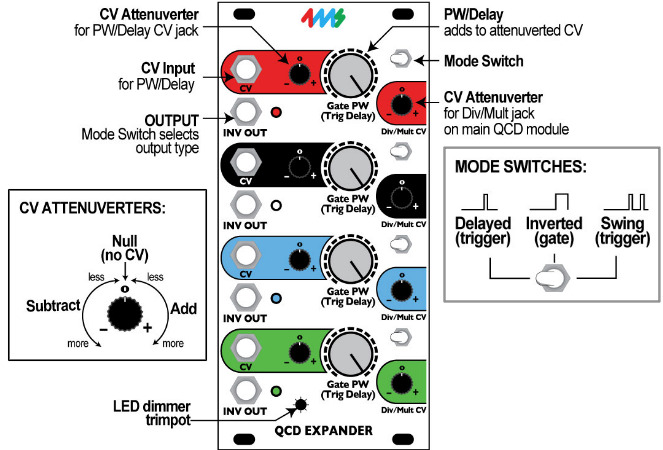 The QCD Expander adds a host of features, turning the QCD into a programmatic non-linear sequencer. Each channel gets a CV Trigger Delay (Pulse Width) jack and knob, an additional output jack with three selectable modes, and attenuverters for all CV input jacks. Self-patched evolving rhythms and swing/shuffle patterns are easily obtained, as well as complete control over standard rhythmic patterns.